Are Homemade Barbie Clothes Making a Comeback? Remember playing with dolls when you were a child? If you were like me, you had a Barbie doll or two in your toy box. Barbie was introduced in 1959 by a lady named Ruth Handler (co-founder of Mattel). Ruth named the doll after her own daughter, Barbara. In 1961, Ruth created Barbie’s boyfriend, the Ken doll, named after her son. Now, almost half a century later, Barbie is still in the hearts and toy boxes of children (and even adults) everywhere. Our children today have more toys than ever. Electronic toys, video games, iPods, and computers are just the beginning. So much has changed in the world of toys since we were children but one thing that hasn’t changed is the simple love of the Barbie doll. Barbie today has new friends, new clothes, a new house, and even more new pets than she did 40 years ago. However, little girls today still enjoy dressing and primping Barbie to act out her fantasy life during playtime. My grandmother was a seamstress. She would sew beautiful clothes and accessories for my Barbie doll collection. I had a suitcase full of her handmade creations and the kids in the neighborhood would come over so we could dress the dolls. I loved selecting the fabrics and picking out dress styles. 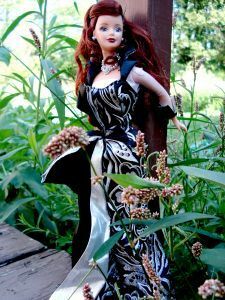 Although I didn’t realize it at the time, the clothes she made for my dolls were better quality than anything I could buy in a store. As a teenager I became interested in sewing. Because my grandmother had passed, I was left to teach myself how to sew. I spent hours upon hours in front of my Kenmore sewing machine turning out beautiful creations. It came so naturally to me. Through the years I created clothing for myself and my family, window dressings, and decorative home decor items. I later spent about 5 years doing ready-to-wear clothing alterations for the general public. Then, about 10 years ago, a dear friend gave me the greatest birthday gift… a Barbie doll. Let me tell you, you are never too old to receive a Barbie doll! While going through some old boxes during our last move, I found a box with many of the Barbie dresses my grandmother had made. The finding inspired me! I would make new clothes with today’s fabrics for my Barbie doll. What could be better than handmade doll clothes? They are hard to find in this day and age because people don’t have or make time to sew like they used to. As I began creating beautiful dresses, everyone who saw them wanted to buy them so I added them to my online craft store. I couldn’t believe the response. I received many emails from people who told me beautiful stories of their mothers, aunts, and grandmothers who handmade their doll clothes when they were children. I then knew that bringing back handmade doll clothes for today’s families would begin new traditions and help create beautiful memories and gifts that could be passed down through generations. In a world where everything is so commercialized, going back to basics with Barbie has reminded me of a wonderful time in my childhood. Today, my greatest joy is knowing that my creations will be passed down through generations and that I have a hand in helping today’s children create memories that will last a lifetime. About the Author: Adrienne Hughes, seamstress and e-book author of “Sewing Patterns Defined” lives with her husband, her Yorkshire Terrier, and her Barbie dolls in Texas. She has no affiliation with Mattel. Until her retirement, she ran an online Barbie clothing store at SewingbyAdrienne. If you prefer to make your own Barbie clothes, check out the Free Printable Fashion Doll Clothes, which includes a pattern for Barbie’s new belly-button style body. These Barbie patterns include step-by-step photos to follow and discussions about several variations of homemade Barbie dresses. We also have a simple pattern for a Barbie Blue Jeans Mini Skirt, contributed by Miss B Couture, who has a growing selection of free Barbie and Ken sewing patterns on her fashion blog for Barbie. Her daughter’s Barbie, who models most of the clothes, is shown around town (at far left) wearing her Barbie Blue Jeans Mini Skirt on the escalator. I’m glad you still find joy in making doll clothes. My friends and I did that when we were young. Unfortunately in my area computers and electronics rule the scene. My niece and her friends sometime complain that there is nothing to do, I tried to teach them to make bracelets, they said that was corny. Them I told them how my friends and I made clothes for our dolls; they said why would we make clothes when you can buy them, plus its alot of work. I said because its fun. This generation is so corny, i guess i should be happy that they like rainbow looms. I think it’s like that everywhere these days which is really sad. I saw a post showing kids around a campfire the other day, all of them glued to their cell phones. I guess roasting marshmallows, or making s’mores, watching fireflies and telling ghost stories is just too corny. They are missing out on life. I hope that you never give up trying to interest your niece in creative pursuits; it’s the best gift, in my opinion, that you could possibly give her. well, how do you make all the old patterns fit the new dolls? I made Barbie dresses for my daughter in the early 1990’s. My friend gave me some old Barbie patterns & warned me that Barbie & Ken had changed proportions at waist & hips. I was careful, as even 0.5″ can make a difference in fit. Do you know when the proportions changed? I believe it was 1999. The blog Janel Was Here has a great page explaining different Barbie body types and when they occurred: Different Barbie Bodies. I’m sure you’ll find it interesting.